The wireless charger is working when the blue light is on. 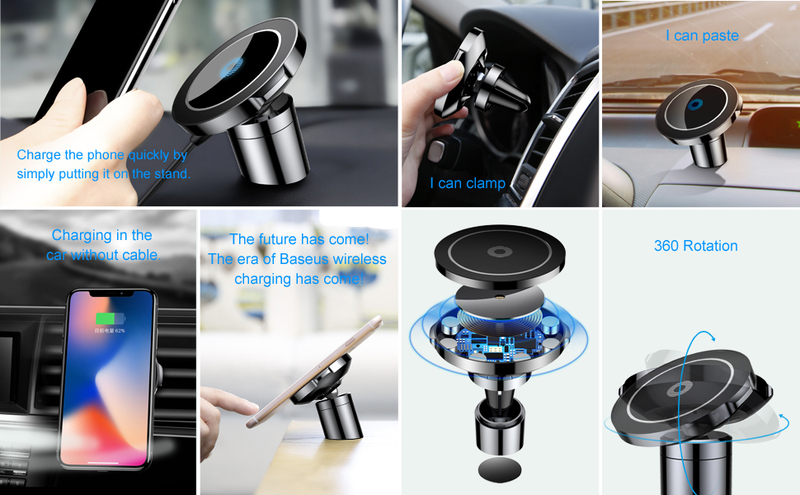 It is also a Car Mount Holder, with this item you can charge your phone while navigating. 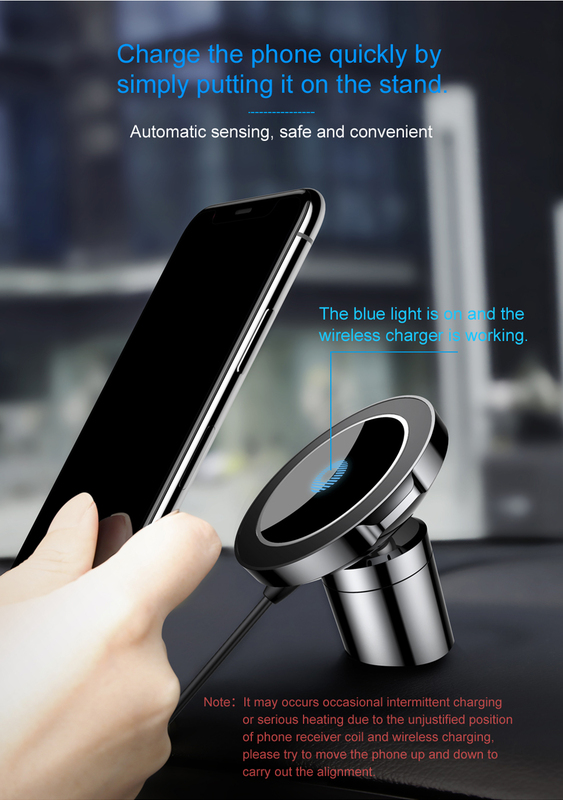 Suitable for mobile phones with wireless charging function or built-in wireless charging ring. Input: DC 4.9V - 5.25V / 1.5A - 1.8A (normal charging); 9V / 1.67A (fast charging) by using QC 2.0 / 3.0 fast charger. Compatible with QC-enabled and Qi-enabled mobile phones. Please note: the product supports 5V/2A fast charge, so your phone needs to support at least 1.5A. Equipped with a high elastic silicone clamp which can be firmly inserted into the air outlet. 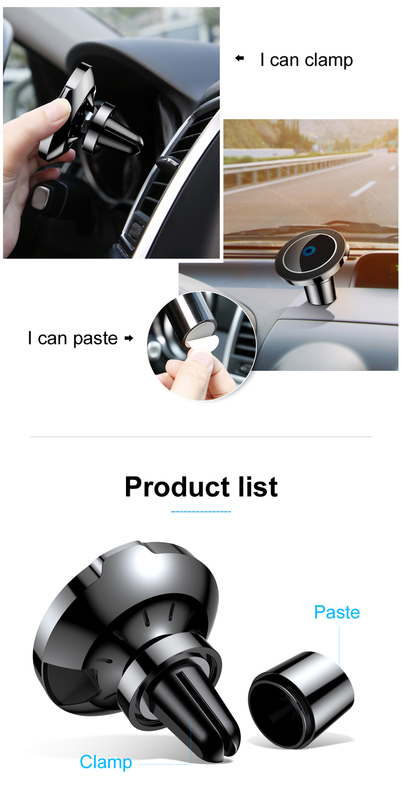 It also can be pasted – the cap is with powerful glue, can be pasted on a smooth surface, such as dashboard, table etc. Universal rotated ball, multiple angle adjustments to satisfy navigation sight. 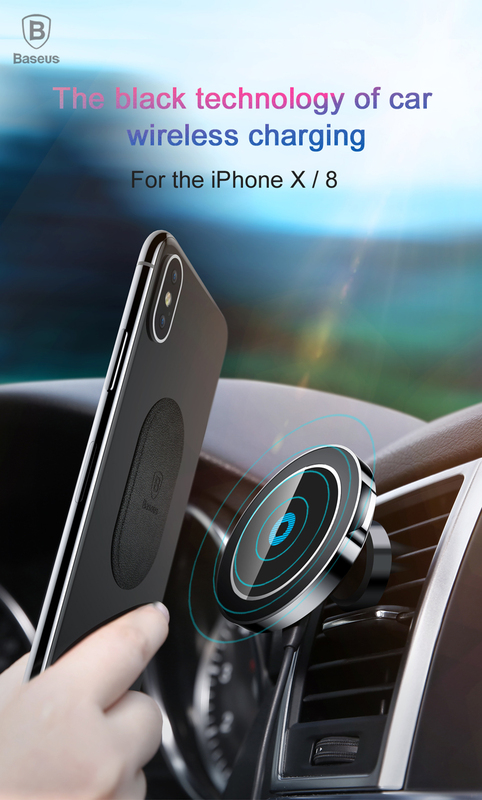 Built-in 8 pieces of powerful magnets, can draw your phone tightly while driving, even when encountering sudden braking on speed bumps and driving on bumped roads. l 3mm Phone Case Friendly: safe charging sensing distance allows you to charge your phone with case that thinner than 3mm. l Constant magnetic field, it does not affect the phone signal. Made of high-quality aluminum alloy and soft silicone materials, it’s oxidation-resistant and corrosion-resistant, durable to use. Tiny size and one-hand design, simplified operation. 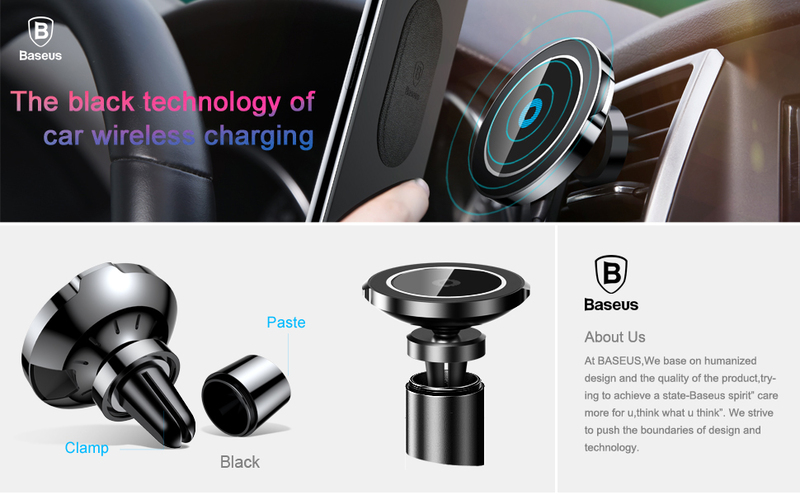 l Suitable for mobile phones from 4.0-inch to 6.5-inch, with wireless charging function or built-in wireless charging ring. 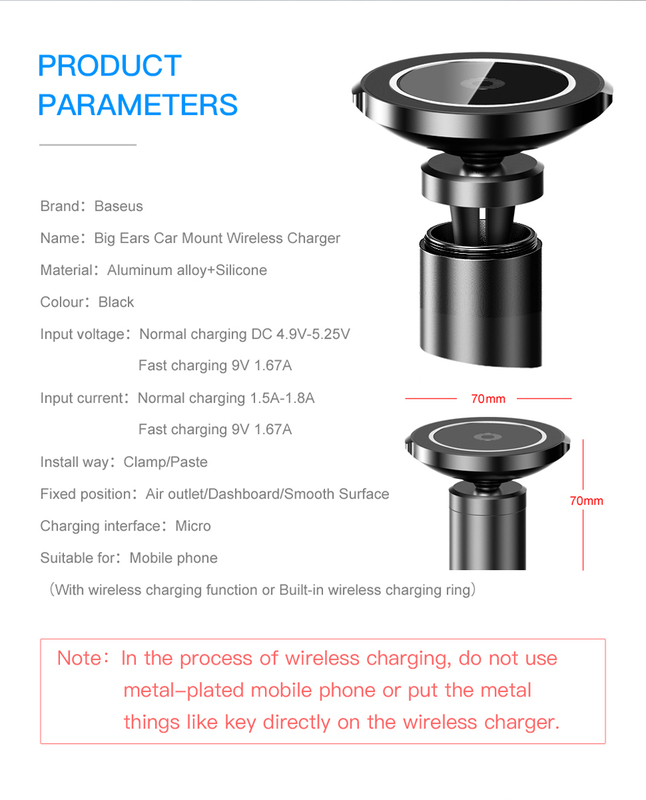 l Make sure not to use metal-plated mobile phone or put things made of metal like keys on the wireless charger when it’s in the process of wireless charging. l As this item is 3mm-phone-case friendly, please make sure your phone case is thinner than 3mm if your phone is with a phone case. l Make sure your phone supports 1.5A charging at least to enable the maximum effect of fast charging. l The leather magnet iron plate needs to be pasted on the back of your mobile phone or phone case to enable wireless charging. Galaxy S9, S9 plus, S8, S8 plus, S7, S7 Edge, Note 8, S6, S6 Edge, S6 Edge plus, Note 5. And other mobile phones which has wireless charging function – please contact us and we can check. Clean the phone mounting area with wet tissue. Use the auxiliary card to aim the centered location and paste the leather magnet iron plate on it. Tap and hold it firmly to make the magnet iron is correctly and firmly pasted on your phone. 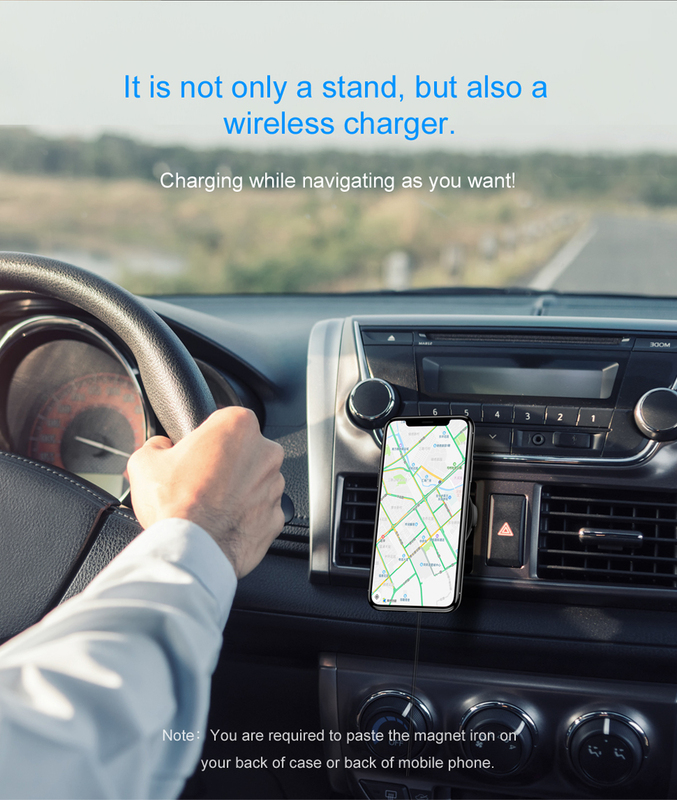 Clamp or paste the wireless charger on the location you want it to be. 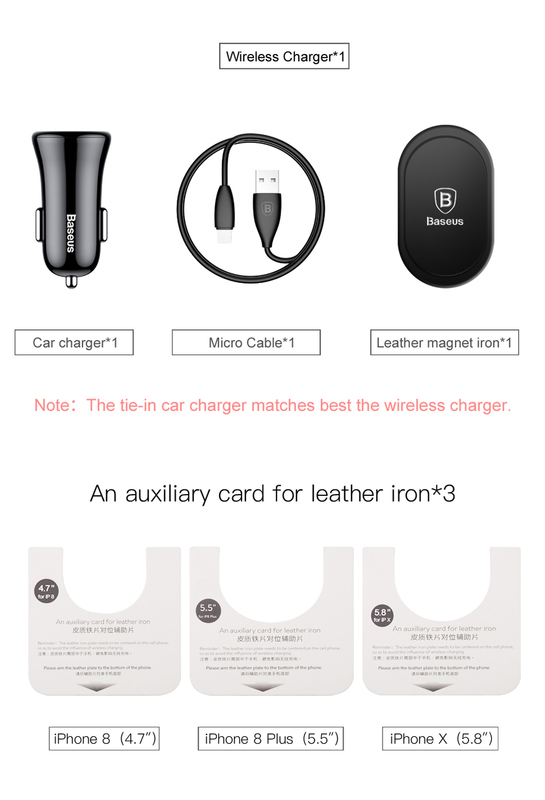 Connect the micro cable (included in the package) with the wireless charger and the car charger (also included in the package). Then connect the car charger to power source. Complete all the steps above, then start using the item by simply putting the phone onto the wireless charger.